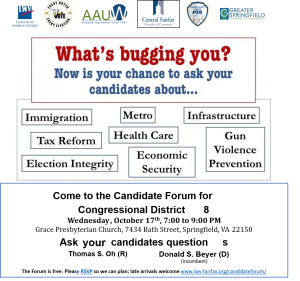 Now is your chance to ask your candidates about: Immigration, Metro, Infrastructure, Tax Reform, Health Care, Gun Violence Prevention, Election Integrity, Economic Security. Co-sponsors: Alpha Phi Alpha Fraternity, Inc; American Association of University Women of Virginia; Central Fairfax Chamber of Commerce; Fairfax County Council of PTAs; Greater Springfield Chamber of Commerce; Jewish Community Relations Council of Greater Washington; NAACP of Fairfax; NAKASEC; Northern Virginia District PTA; Virginia Interfaith; Voice of Vietnamese Americans; Zeta Phi Beta Sorority, Inc.
Come to the Candidate Forum for Congressional District 11 on Sunday Sept 16th 2:00 – 4:00 pm. 3740 Old Lee Highway, Fairfax, VA.
Jeff A. Dove, Jr. (R), Gerald E.(Gerry) Connolly, (D), Stevan M Porter (L). 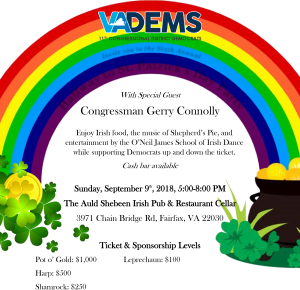 Enjoy Irish food, the music of Shepherd’s Pie, and Entertainment by the O’Neil James School of Irish Dance white supporting Democrats up and down the ticket.